MB: Where’s the sick bags? When it came to the dark bloody console wars of the 90’s I was more that a foot solider, I was a standard bearer. If you cut me I bled Nintendo red. I laughed at the Game Gear for needing 54 batteries to play, I scoffed at the 32X & the MegaCD with their grand total of 3 games. But despite my fanboy showmanship I was jealous and I have to admit there was certain things Sega did that Ninten-didn’t. I thought Michael Jackson was pretty great – but I never got to dance in MoonWalker. I used to play Outrun in the sports centre cafe but would never drive that red Ferrari at home. Then of course there was that blue hedgehog. To me Sonic always seemed to be deliberately everything the Mario games weren’t. While Nintendo’s plumber’s games focused on exploration, caution and precise tight controls, Sega’s mascot enjoyed adventures that were much more free-form. The focus on speed meant that fast reactions yielded success and there was absolutely no point in exploring. Of course there were the rings to find, but considering you didn’t need to find them all to open the bonus stage, why would you bother to look when the minimum had been found? As a gamer who grew up on Mario, I may have wanted to play the Sonic games but I probably wouldn’t have got on with them too well. The two series are so different and in many ways reflect the consoles themselves; the SNES was white, the Mega Drive black. Nintendo was something your Mum would approve of, Sega was edgy, dangerous and stuffed with attitude. Mario was Blue Peter, Sonic was Grange Hill. 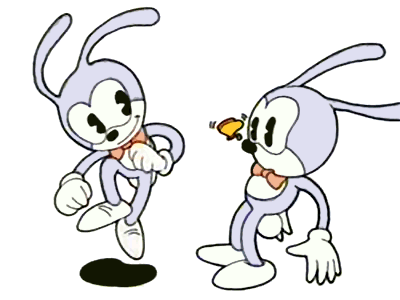 There was a version of Sonic I would have liked as a youngster though and it involved a rabbit called ‘Feel’ with long floppy ears. With these he could do all manner of tricks, including clutching, then throwing enemies and scaling new heights. He didn’t run at lightning speed, he didn’t curl into a ball when he jumped and he didn’t exist beyond sketches on paper. This version of ‘Sonic’ was simply a concept, abandoned when the game became fixated on speed. Feel’s long floppy bunny ears confused and bogged down the game. For the longest time ‘Feel’ sat abandoned on a designer’s sketch pad until the final months of the Mega Drive’s life. Keen to explore game play styles that couldn’t comfortably exist in the Sonic universe, Sonic Team revisited old ideas to search for a new direction. The long-eared rabbit was to make a triumphant return, only he would have a star affixed to his face and his arms would be stretchy, rather than his ears. He would be named Ristar and he would exist in a game that Sonic never could. 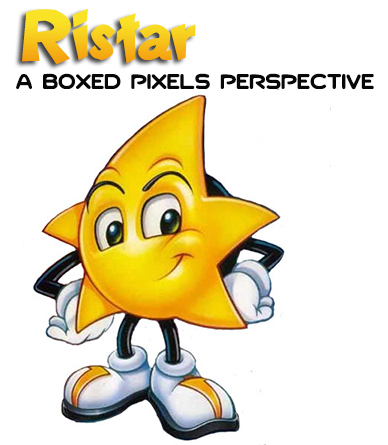 Of course, being a product of the 90s, Ristar was a 2D platformer. Released in 1995, just 3 months before the release of Sega’s 32-bit ‘PlayStation-beating Saturn, it was consequently overlooked upon release – lost in the excitement for the 5th generation systems. Ristar’s story is introduced through a quaint opening cinematic that depicts an emotive story of how a young shooting star is called upon to save a number planets in peril. Brainwashed by ‘Greedy’ the alien oppressor, the leaders of these worlds are lost, enslaved, and in need of a star. In the Japanese release, Ristar even has the added pressure of having to out-shine (pun definitely intended) and rescue his father. This is a somewhat ridiculous plot, but it is bizarrely reflective of the unconventional platforming action that is to be enjoyed. 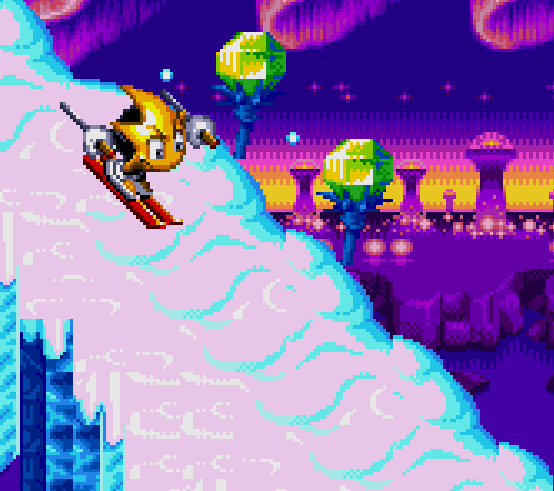 Despite the attempts for Ristar to be a separate entity, its engine echos sentiments of the Sonic series. 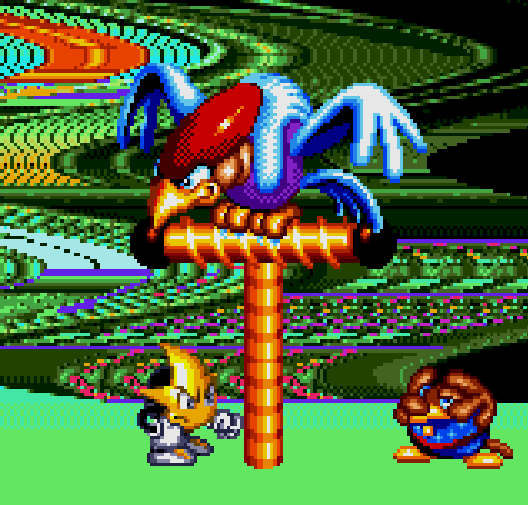 Ultimately, the game play is best described as one part Sonic and one part Bionic Commando, with Ristar’s stretchy arms as the key mechanic of the game. Much like the original ‘Feel the Rabbit’ concept these arms are depended upon for everything in the game – their long-reach ability is how you attack enemies, climb walls and traverse trees and pegs. It’s a bit awkward to control at first and at odds with everything I was used to. By default I jumped onto an enemy’s head only to be punished for doing so. It’s clear that Ristar is trying something new, not treading the familiar 16-bit platformer path. A little patience pays off and beyond the opening stages Ristar’s talent for extending his arms in 8 directions soon becomes second nature and intuitive. The game isn’t overly difficult, but there are some tough points in later stages where precision movements are needed, and boss fights prove challenging. Despite these spikes in difficulty, you never feel cheated. Mistakes are often the fault of a lack of finger dexterity on the part of the player, rather than cheap design within the game. With such a quirky and unique core element, there is a real danger that level design could be hampered. While it is true that you predominantly do the same thing throughout the game, the need to swing and climb never feels ostentatious or at odds with the level design. Finding each hidden space, defeating each eccentric boss and solving each stretchy arm puzzle feels integrated and organic. The game’s continually fresh feeling is certainly helped by the distinct worlds that Ristar travels through. Of the seven planets that make up the game’s solar system, each is unique and distinct. The first world’s tropical jungle, where you swing through a lush green environment, is just a starting point in an adventure that sees you passing through an ice planet, a fire world, a mechanised level and, most excitingly, Planet Sonata; an environment themed entirely on music and sound. But it’s not just aesthetics that distinguish the stages; each level requires new ways to utilise Ristar’s versatile limbs and offers a different variety of enemies – from frogs on Undertow, fire beasts on Scorch and even musical birds on Sonata. 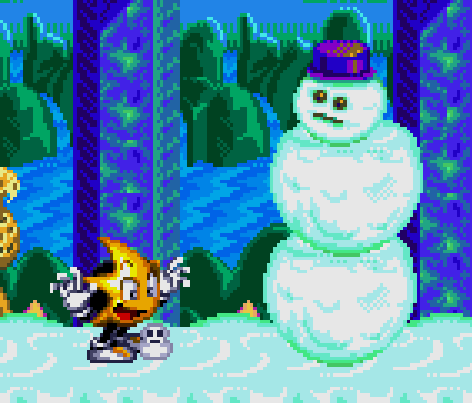 The level of individuality and attention to detail even extends to the titular character himself, as Ristar has different idle animations depending on which world you’re on; building little snowmen, dancing and even mopping his brow as the environment dictates. These little touches give Ristar (the game and the character) personality and variety, and in so doing, disguises what could have been a slightly repetitive game. This is all aided by how stunning the game looks – I defy you to not stare at the backgrounds and environments with awe. Ristar pushed the Mega Drive almost beyond its limits to portray each of these planets with a spectacular vibrant palette. This may have been one of the advantages that came from its extended development period, or it perhaps is also the result of Sonic Team honing their skills on the countless blue hedgehog games that preceded Ristar. It does feel at times that you are doing a whistle stop tour of all of the best locations seen by the Blue Hedgehog, but even so, these places have never looked better. The unique graphical effects liberally but subtly scattered throughout still impress today. I am obviously accustomed to the Super Nintendo’s superior graphical capabilities. However, I’ll be first to admit that the bright and colourful aesthetic of Ristar, with its detailed sprites and fluid animation, is on par with all but the best SNES games. The game could be released as an iOS title today and would be universally applauded for its appearance. It proves that while the Mega Drive may only be able to display up to 64 colours at once (from a palette of 512) rather than Super Nintendo’s 32,768, that didn’t prevent it offering some beautiful pixel art. Ristar’s level design and visuals far exceed those of the Sonic games, but sadly Ristar’s music simply didn’t compare to the rest of the brilliance on offer. Sonic Team’s typical catchy melodies are present but too many musical pieces are short and the tune repetition is grating. It feels like the tracks were made in isolation to the rest of the game – not entirely appropriate for the stages at times. It’s not got a cohesive soundtrack, however good some tracks maybe individually. This may be nit-picking of course. Searching for faults that are only exist in comparison to everything else on offer. With a difficulty curve that’s a 45 degree slope, and continually inventive ideas, the imagination and craftsmanship of Ristar is a credit to its console. Ristar was consciously, and deliberately, exploring ideas that Sonic couldn’t and consequently it ends up treading closer to Mario’s turf; the very game style that Sonic originally aimed to avoid and belittle. Perhaps this is why I like Ristar so much. Playing it now reminds me of Mario World to a certain extent. It may be wrong to say Ristar is a Mega Drive game attempting to be a SNES game, but it certainly is a game aware of the virtues of the Super Nintendo greats. It’s a composed game, a confident game, a game you don’t rush through as quickly as you can and hope for the best. It looks far better than I thought possible on a Mega Drive and was a genuine pleasure to experience. Imagine if the Nintendo fanboy of old could see me now, how he would shake his head in disgust. If you enjoyed this post by Julian Hill, you can read more of his writing at www.boxedpixels.co.uk. 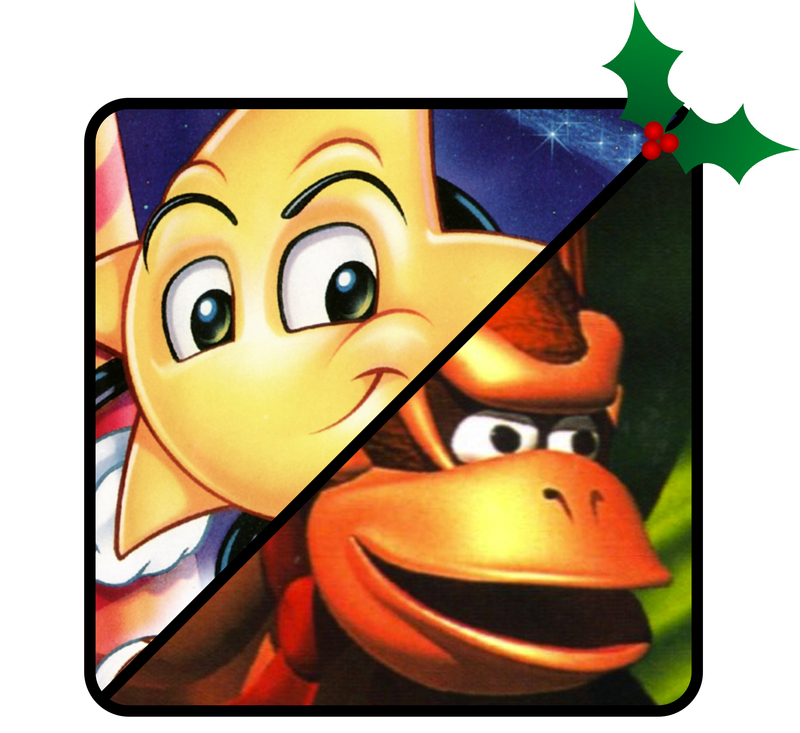 Click on over to visit BoxedPixels.co.uk, for MegaBites’ Donkey Kong Country review.